January 13, 2018 0 comments on "11 Expert Tips for Cleaning a Toilet"
Q: I was wondering what the best cleaner for cleaning a toilet is. I know the disposable cleaning brushes are good, but I don’t want to waste money like that…does anyone know anything that is not a waste of money and doesn’t smell??? Tip #1: May sound crazy, but I use a couple of things depending on the day. If the toilet is really dingy looking, I use bleach (but yes that does smell). On other days, I’ll use vinegar (again, that smells, but the smell dissipates quickly and really leaves the bowl smelling fresh), and then when it just not dirty, but I’m gonna clean it anyway, I use an old bottle of Suave shampoo. Cheap, and smells great. Tip #2: Go to the Dollar store and buy a cheap tube of regular tooth paste–not gel. Wet the toilet brush and squeeze some tooth paste on the brush. Start cleaning under the inside rim and work your way throughout the inside of the bowl. Sounds crazy, but it works, and it smells good. 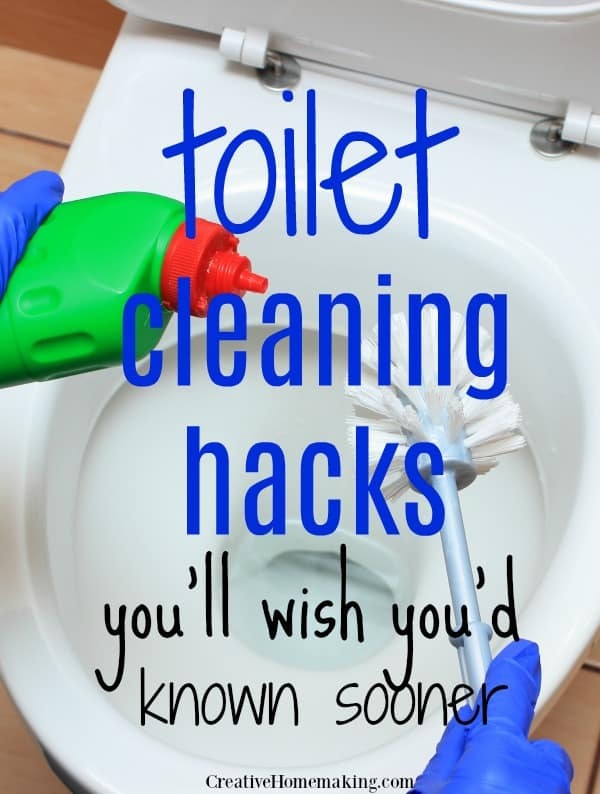 Tip #3: Good old Comet and the regular toilet bowl brush is all you need!! And if you have any scratches in the bowl, just sprinkle the Comet in and let it sit there for 30 minutes or more and the scratches will be gone…with no scrubbing!!!! That is all I ever use and my toilets sparkle and smell fresh!!! Very economical and no odors!! Tip #4: I also think those disposable cleaning heads are too expensive. I buy the cheapest toilet brushes I can find, like for $1.00. Then I can throw them out fairly often without feeling like I’m paying way too much! Tip #5: I put on gloves, take an old rag, wipe down the outside, then wipe out the bowl, then I throw the rag away. I get the convenience of the disposable products without the cost. Rags are free…old washcloths, and dishcloths always get demoted to rags when they wear out, and I cut up old clothes and towels also. I always have a good supply of them, so I don’t mind throwing a rag away. Tip #6: I use CLOROX Toilet Bowl Cleaner with bleach. It’s not pure bleach so it won’t ruin your toilet. But I wash with rags (old/used towels) and wearing gloves. Once in while I will use a brush but not very often. If it’s kept clean, there is no need for it. Tip #7: I too recommend Comet or that type of cleanser. A toilet brush that is slightly oval or has small brush on opposite side of larger to get under the lip of the bowl. Comet type cleansers don’t leave too much odor but do get rid of bad odors and are rather inexpensive and work well – even store brand will do. Tip #8: I have heard of using denture tabs…like Efferdent…in the toilet. I have never tried it but I wonder if this would help get rid of the stains. Tip #9: For a cleaner toilet, believe it or not..use the drink…TANG. When I first heard about it I was not about to waste my kids’ favorite beverage in the pot, but I gave it a whirl anyways. It works and leaves your bathroom smelling like oranges. I put a few scoops in the bowl and leave it for a while, wipe, flush and VOILA….a clean toilet. Hope this was useful. 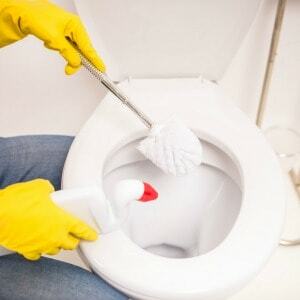 Tip #10: Try The Works toilet bowl cleaner for the worst looking toilets. We are in a hard water area, out in the country with well water. I use it about every 3rd week. After getting it clean, I use just the brush and clean water in the bowl EVERY morning to keep it clean. Does need a good scrubbing with The Works every so often. Tip #11: Swish toilet with brush, flush, deposit four denture cleaning tablets (dentures are made of porcelain also), close lid go do something else, swish with brush and flush. Follow my cleaning board on Pinterest.